With the Blu-ray and DVD release of Star Wars: The Force Awakens just around the corner, debuting on April 5, Harrison Ford has been hitting the talk show circuit lately to promote the home video release. The actor recently made a surprise appearance on The Ellen Show earlier this week, where he was asked about the highly-anticipated Star Wars Anthology: Han Solo spinoff. While an actor hasn't been chosen to play the young Han Solo quite yet, Ellen DeGeneres asked Harrison Ford if he had any advice for whoever takes over the role. His answer may surprise you. "Don't do it. At first, it seems like everything is going swimmingly, and you put in 25-30 years, and they just let you go. They show you the door and go, 'We're done with you, thanks very much.'" Star Wars Anthology: Han Solo is set before Star Wars: Episode IV - A New Hope, providing an origin story for Han Solo in the years before he met Luke Skywalker (Mark Hamill) and Obi-Wan Kenobi (Alec Guinness). Last week, we reported that the casting search is down to just a handful of finalists, including Alden Ehrenreich, Jack Reynor, Taron Egerton, Miles Teller, Ansel Elgort, Emory Cohen, Jack O'Connell and Blake Jenner. It isn't known when a final decision will be made on the role at this time, but we'll be sure to keep you posted with more updates. Harrison Ford also appeared on Jimmy Kimmel Live! last night, where he shed some light on his iconic character being killed off in Star Wars: The Force Awakens. As you may know, the actor actually wanted his iconic character to be killed off at the end of 1983's Star Wars: Episode VI - Return of the Jedi, which closed out the iconic original trilogy, but George Lucas decided to keep him alive. 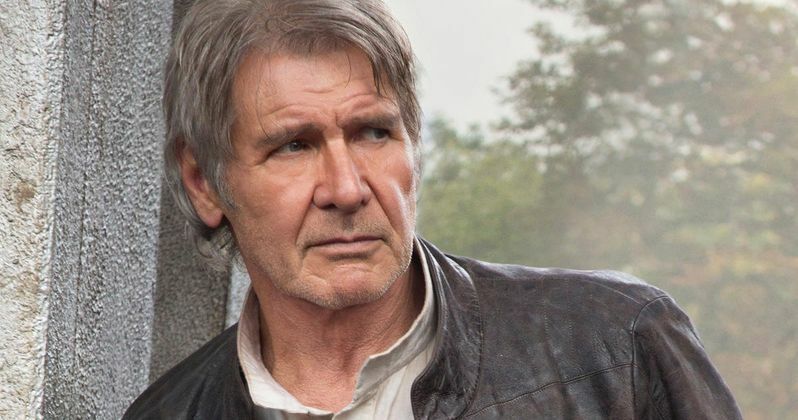 Here's what Harrison Ford had to say about finally getting his wish and having Han Solo killed off, while addressing the fact that this big secret wasn't leaked ahead of time. "I argued for 30 years for this to happen and finally I wore them down. It's pretty amazing, actually, that people actually respected their fellow audience members, to the extent that it didn't get around. It was fantastic. I think they know that I would show up at their house and beat the s--t out of them." The video from Jimmy Kimmel Live! also features a bonus features clip from the Star Wars: The Force Awakens home video release. This video takes us behind-the-scenes of Harrison Ford's scene where he enters the Millennium Falcon for the first time. Take a look at both of these videos below, and stay tuned for more on the Star Wars: The Force Awakens release on Blu-ray and DVD, and Star Wars Anthology: Han Solo.